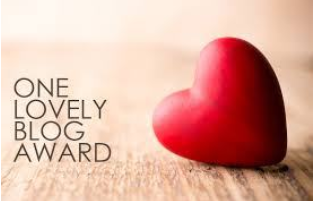 I was recently nominated for the One Lovely Blog Award!! I love writing and having other like-minded people taking the time to read my thoughts on unraveling life’s loose threads is certainly a bonus. I would like to thank Left With Louie for the nomination. 1. I LOVE to travel! I was bitten by a ferocious travel bug in 2000. I spent 10 glorious days with my oldest daughter, Katie, after she completed her college abroad program in Italy. We visited Milan, Venice, Florence and Rome! Need I say more? 2. I have written a humor column called “You Gotta Laugh” for my Texas hometown newspaper for the past 18 years, although do not feel that I am a particularly funny person. It’s my family that is hilarious! 3. I’ve had jobs as a switchboard operator, file clerk and legal secretary. And yes … I can type about 90 words per minute but can’t text worth a flip! 4. I am very patient and persistent. My mother, now age 81, lost her green card in 1948. It never became an issue until a few years ago when Texas state laws were changed. Mom couldn’t prove she was here legally … so no driver’s license renewal. It took me 3 years … but I got it for her! 5. Yes … my real name is Dixie! I was named after Bing Crosby’s first wife. 6. I have been quilting for the past 30 years and try to learn a new skill with each new quilt project. I also credit my lovely quilting friends, you know who you are, as my reason for becoming a better quilter! 7. I am a history nut … particularly World War II and Civil War! Wow, that was difficult! I follow a lot of blogs and love reading them all. I hope you click-through to these sites and enjoy them just as much as I do.